4 Celli. Many have arranged some of the short piano works of Grieg for cello quartet; these are my additions to that repertoire: Wedding Tune Op 17/6, The Swain Op 17/2, Wedding March Op 17/3, Wedding Song Op 17/24. The two Reger works are originally for male choir: “Ich Hab’ die Nacht geträumet” (“I have dreams at night”) and “Liebchens Bote” (“Sweetheart’s messenger”). Both are in the form of a short theme and a few variations, and richly chromatic and expressive. All in bass clef and not above first position; mostly easy. 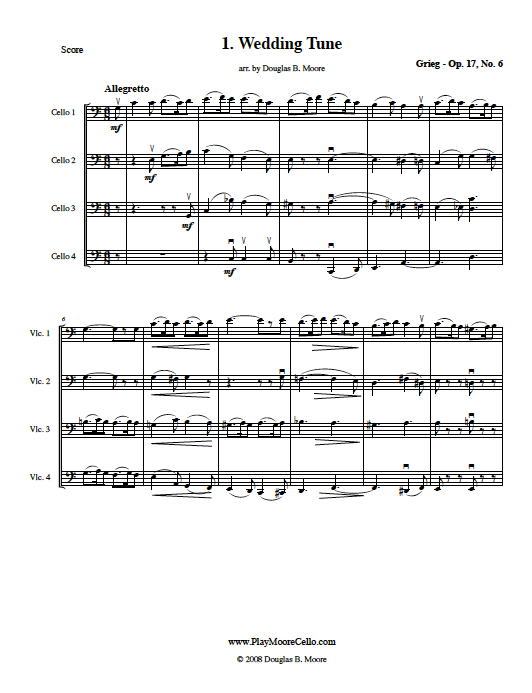 Score and 4 parts. Recorded example is of student cello orchestra playing the theme of “Sweetheart’s Messenger”.